During Konami's E3 press conference, they announced a World Championship for Metal Gear Online about the same time they announced MGO's Gene expansion pack, which launched yesterday. The championship tournament is set to take place at the Tokyo Game Show in October, and is open to players from North America, Europe, Japan and Greater Asia. Those four territories will hold regional championships, and the top teams therein will get a free ride to the Tokyo finals. The tournament kicks off at San Diego Comic-Con, where players can register and compete for prizes. Details for the regionals themselves in North America will be announced soon. Full details after the jump. Anyone here tournament-worthy? Konami Digital Entertainment, Inc. is excited to share with you the first details of the Metal Gear Online World Championship 2008. 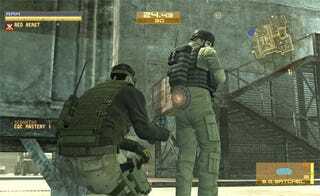 Taking place at Tokyo Game Show this October, the Metal Gear Online World Championship 2008 is open to the best players in North America, Europe, Japan and Greater Asia. The top teams from Regional Championships in all four territories will receive all expenses paid trips to the MGOWC08 Finals in Tokyo, Japan. To kick off the event Konami will be hosting an exhibition tournament at this year's ComiCon in San Diego, CA. Gamers attending ComiCon can register to enter this exhibition and compete for prizes. More details on the North American Regionals will be announced at a later date.